Mozzarella cheese is a semi-soft cheese made of cow's milk. It has a creamy rich taste. Price is sold per fresh mozzarella ball. Cream cheese is a soft, mild-tasting cheese with a high fat content. Cream cheese is not naturally matured and is meant to be consumed fresh, and so it differs from other soft cheeses such as Brie and Neufchatel. It is more comparable in taste, texture and production methods to Boursin and Mascarpone. Price is per pound. This round, yellow cheese is named after the Dutch town of Gouda. Gouda is a traditional, creamy, hard cheese covered in a wax rind. The flavor is sweet and fruity. As time passes, the taste intensifies and becomes more complex. Gouda is considered to be one of the world's great cheeses. It is both a table cheese and a dessert cheese, excellent with fruit and wine. Price is sold per 7oz wheel. 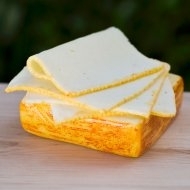 Muenster is pale in color and smooth in texture with an orange rind. It is made from cows’ milk. The orange color is a vegetable coloring. It usually has a very mild flavor and smooth, soft texture. Price is per pound. Gouda is a Dutch yellow cheese made from cow's milk. It is named after the city of Gouda in the Netherlands, but our Gouda is made right here in Wisconsin! Price is sold per pound.